Coast to coast to coast to coast – a cafe tour of two countries. We’d had this ride planned for ages. Probably about a year. We should have done it late last summer but Guy got spannered a few weeks before so it was moved to last weekend. Like all the best plans, it was a simple but ambitious one. 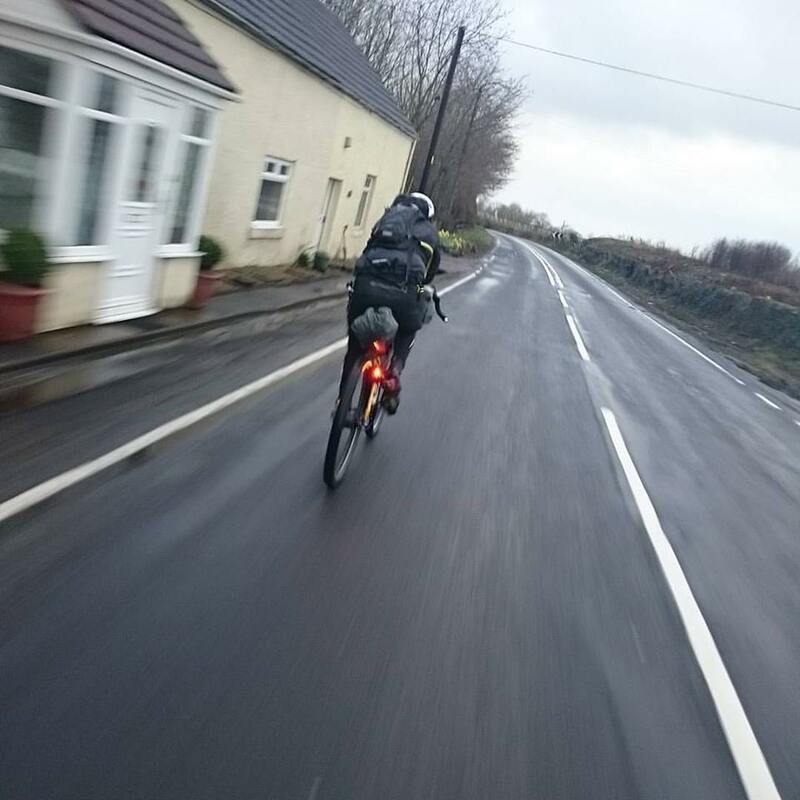 Ride from somewhere on the east coast of the UK, finish at Cairnryan ferry port on the west coast of Scotland, sail across to Northern Ireland and ride to Portrush on the north coast. 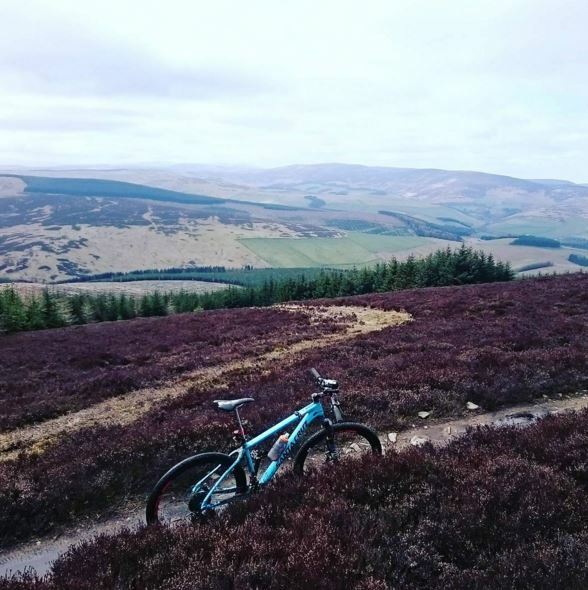 While we were going we’d ride as many trail centre red routes as we could (hopefully all of them) – there are 7 in the Scottish borders and 4 in Northern Ireland. As well as doing something as silly as this because, well, it’s silly, we’d be helping to raise money for the RideForMichael charity – helping Michael Bonney pedal a bike again. Apart from the fact that we were going to be joined by various other riders along the route, we didn’t really have a plan at all until the day before the ride started but we soon got our arses into gear and Guy decided to ride to the start of the ride while I was still at work on Wednesday. As warm-ups go, 190 miles from Grimsby to Berwick-Upon-Tweed is somewhat on the big side. It was 5am Thursday morning before I’d packed and then driven there to meet him for a pre-ride MacDonald’s breakfast. Once started we kept the pace ‘friendly’ and it was almost noon before we met Sam and his dad at Innerleithen, where we’d ride the first red route. Neither of us had met Sam before but luckily we all hit it off and carried on ticking off the miles while Terry drove the van to the next trail centre. 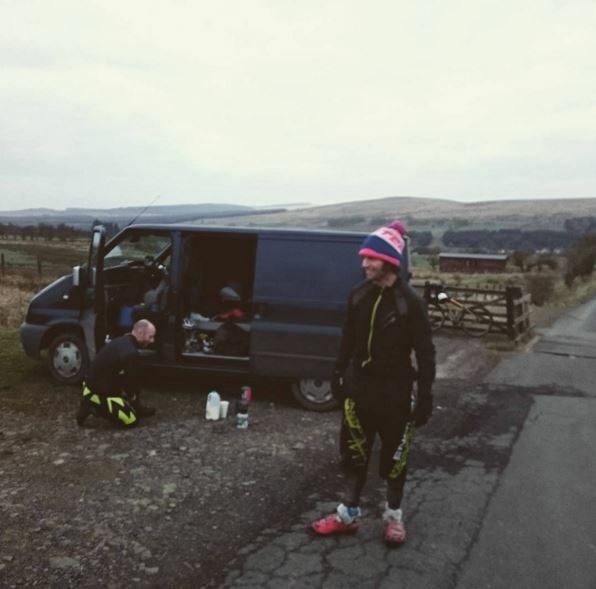 While we were riding across Scotland the constant presence of a van full of teabags, cake and clothing gave us a degree of comfort, especially when me and Guy allowed ourselves a couple of hours sleep in it. We carried on grinding out the road miles and riding trail centres. We visited pie shops, were given chocolate and we drank tea. Lots of tea. 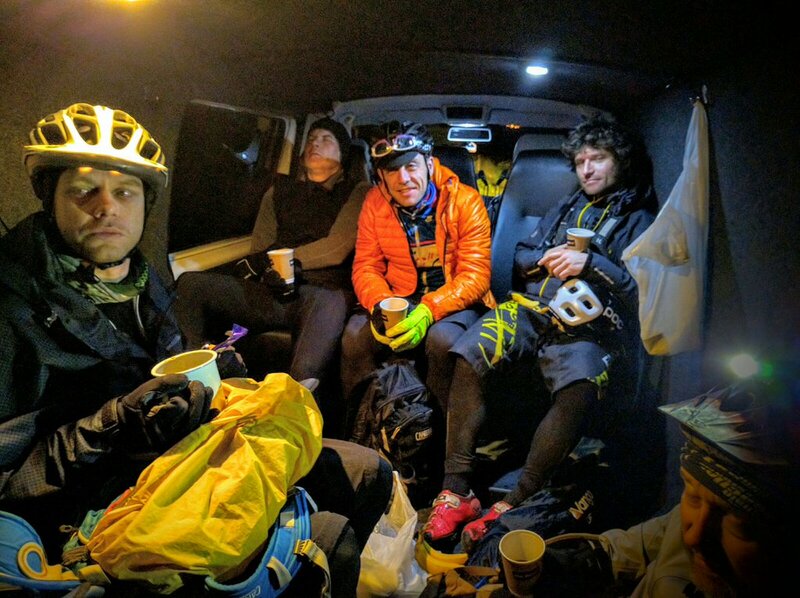 We tried to sleep in bivvy bags in Newcastleton Forest at minus four degrees when most of the civilised world would have been in the pub or watching Ant and Dec.
We booked a ferry – then realised this was going to be tight. We had to be at the ferry terminal by 11pm to catch the midnight ferry to Northern Ireland. 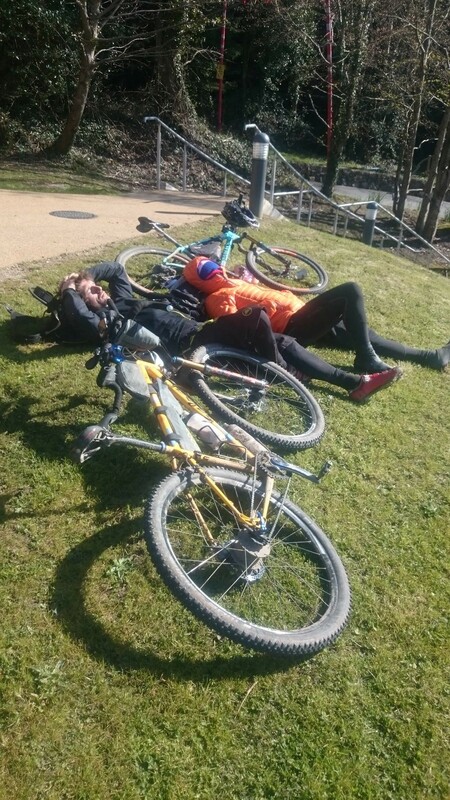 At Ae Forest, we were met by Michael and an ITV local news crew – an hour or so later we were on our way again…..
We had a 90 mile sprint along the A75 if we were going to have a chance of making it to the ferry. Heads down, pedal. Dave and Phil had joined us and were toiling at the front of our small peloton while HGVs passed us at speed. Then it started to rain. Pedal harder. Before long, the ITV news report about what we were doing had been broadcast so cars started to beep their horns and increasing numbers of (no doubt bloody freezing) well-wishers appeared in laybys. We were freezing too – we needed the rain to stop. We arrived at Cairnryan ferry terminal on time, where we said our goodbyes to Sam and Terry who had both made the journey across Scotland an absolute pleasure. The P&O staff soon whisked us onto the boat and gave us the Club Lounge, complete with complimentary wine, nibbles and a full Ulster breakfast (imagine a full English breakfast but with chips). They even took our wet and stinking cycling clothes and washed and dried them. P&O’s captain Colin and his crew are the greatest! 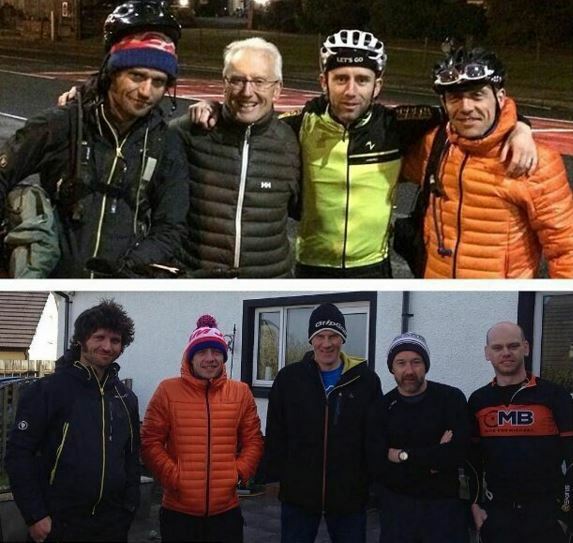 After we’d had a kip and we’d pulled our now-clean clothes back on, we met Geoff, Dave and Mike – all members of the RideForMichael fundraising team – who would ride with us on the Ireland leg of our journey. After a cuppa at Geoff’s, we were on our way again. First stop was the local mini-trail centre then we were off towards the bigger stuff. Growing up in England, it’s easy to imagine Northern Ireland as some kind of burnt-out cars and barbed wire warzone, but in reality the scenery and terrain there is eye-poppingly beautiful. Mountains, valleys and vast expanses of green as far as the eye can see. Onwards we rode, ticking off big climbs and more trail centres. Castlewellan was my favourite trail centre of the entire trip – lovely, fast and flowing, the flow only interrupted by me crashing full-pelt into a tree. More tea stops. More Guy fans asking for selfies. More cake. More road miles and plenty of sunshine. A massive, picture-postcard descent into Rostrevor. Go to Northern Ireland – it’s belting. Things started to get strung out in the small hours of Sunday morning as the end of the ride approached. After a very welcome tea and cake stop (perhaps the 25th tea and cake stop for me and Guy since we left Berwick on Thursday, 500 miles ago. ), a couple of riders fell asleep while riding, one almost hit the wall entirely. Everyone was tired, in fact I worked out that I’d had 5 hours sleep since Wednesday morning. Dave S and Guy trying to grab 40 winks in the most revolting disused steel bus shelter in the world was a particularly worrying moment but eventually everyone made it to Geoff’s mum’s house in Portrush, where we had steak, chips, mushy peas and Stella Artois for breakfast. Result! I consider myself very lucky to have been involved in this ride. Not only were we raising money to help a friend in his time of dire need, but we were forging new friendships, stepping a long way out of our comfort zones and having the time of our lives. And eating a lot of food. Thanks to all the lads and lasses involved – Geoff, Sam, Terry, Mike, Dave S, Dave’s mum, Dave P, Phil, Guy. Thanks to Margaret for cooking the epic finish line breakfast, Sharon for picking me and Guy up from Scotland to take us home and thanks most of all to Michael Bonney for giving us all the inspiration and determination to finish the job. Top effort boys. Good training for America!